I am new user to PCSX2, this program that I like a lot, as it can continue to play its games has favorites ps2 on pc. I finally found a problem, and that I can not understand to solve it. This is Gran Turismo 4, which exams are allowed inaccessiblent was because of a problem "Assert Failure", everything goes normally until the main menu home, but I go to section enabled, the dialog box appears, and I watch you with this screenshot of the error message. I have already seen a similar thread, but unfortunately no solution. Can some help please? Does this happen with any other builds? Try remaking the ISO from the Disk. 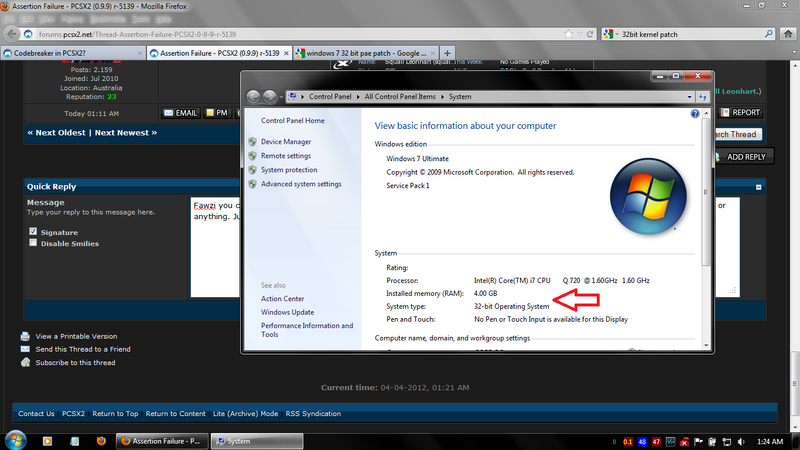 (04-02-2012, 06:04 PM)recoder Wrote: Does this happen with any other builds? Try remaking the ISO from the Disk. Yes, I had the same problem with "Tourist Trophy" game (from POLYPHONY DIGITAL too), and that the same problem also playing directly from the original DVD, and this DVD have no problem and fully functional on the ps2. I already try version 0.9.7, and 0.9.8, it's the same ! (thank you for help) please. better list your pcsx2 config, plugins settings, pc specs.. Segmentation fault / assertation failure occurs because the emulator runs out of 32bit address memory to allocate. This game easily consumes 3-3.5GB of virtual memory due to a bug in GSDX(atleast thats what i was told) so you must patch the PCSX2 executable to support large addressing. I'd like to see this supported in the official builds and svn's but it would require frequent testing to make sure new changes don't break something because of it. (04-03-2012, 02:17 PM)Squall Leonhart Wrote: Segmentation fault / assertation failure occurs because the emulator runs out of 32bit address memory to allocate. This is why. unfortunately large addressing has no affect on 32bit without changing the boot configuration to allow 3GB of user address space. Fawzi you could use a kernal patch to allow 32bit OS to break the 3GB RAM barrier. I've been using it for almost 2 years and haven't BSOD or anything. Just google "windows 7 32bit pae patch" and i hope you find a good one. Also i recommend the use of 0.9.8 if the svn keeps giving you trouble.